The presentation of the 2012 Sir Misha Black Awards took place on Thursday 8 March at the Royal College of Art, London. “Sir Misha Black was a key figure in industrial design and design education in the 60s and 70s. He was a Vice President of the International Council of Societies of Industrial Design, a Royal Designer for Industry and served both as President of the Design and Industries Association and the then Society of Industrial Artists and Designers – now the Chartered Society of Designers. That is why these bodies are so well represented here this evening. Sir Misha died in 1977. The organisations to which he had given so much met and agreed that the most fitting tribute to his life and work was to recognise the vital role of teachers of design. 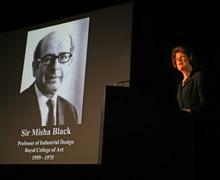 So, The Sir Misha Black Medal for Distinguished Services to Design Education was established. In 1996 the Royal Academy of Engineering joined in the Awards in recognition of the growth of design studies in engineering universities and the pioneering work of Sir Misha in this field. The first Medal was struck by the Royal Mint and presented to Sir William Coldstream by HRH Prince Philip in a ceremony in Buckingham Palace in November 1978. In 2003 the 25th Anniversary was marked by the establishment of the College of Medallists, as a group in its own right, and the Committee may now seek the advice of the College on important matters. As far as we are aware, this award is still the only international award honouring design educators and the only award made collectively by the premier design and engineering institutions in this country. It has been likened to the Nobel Prize for design educators. The Award for Innovation in Design Education was inaugurated in 1999 to recognise a person who, or a team which, has made an innovative move, clearly demonstrating that the education of designers has been measurably improved and the profile of design education raised. This award is not necessarily made annually but only when these demanding criteria are reached. This year the Award will be made to the Manchester School of Art to be accepted by Professor David Crow. When these awards were established in 1978 the world was a very different place. Fax machines were not in common use until the 1980s, pioneering testing of mobile phones began in 1983 and it was the end of the 1980s before anything remotely resembling today’s lap tops were generally available. Today we all take instant personal global communication for granted but, as our world grows ever more complex we will need even more skilled designers, engineers, planners, architects to predict, plan and produce a safe and inclusive path through the labyrinth of change. Change which is effecting the social, economic and personal well being of all people regardless of where they live on this planet. Professor Manzini is the great advocate of social innovation leading to sustainability but especially for educating designers to work together to this end. But before the designer comes the teacher. Great teachers are to be treasured because the quality and content of design education today will not only have a direct bearing on the physical world of all our futures but, even more importantly, a permanent influence on whether there will be a safe planet to sustain and nourish our children and grandchildren and generations beyond. There has been much talk in the UK national press of late about the desire to use criteria, other than the single most important one, which is excellence, for admission to universities. A quote from a recent article in The Telegraph: “the Government’s response is to appoint someone who wants to punish our universities because they dare to say that they will not lower their world-class standards.” This is the challenging educational environment in which teachers of design must work today and students must travel on the path to graduation. It is unlikely to get easier. In age where there is much self-centredness, and good teachers remain selfless. “My thanks to everyone involved in organising this ceremony and to those who have taken part: to H.E the Italian Ambassador for being with us: to the Sir Misha Black Awards Committee for their dedication and work: to Wilhelmina Bunn our administrator, for her devotion to our cause; to the Founding Bodies for their support, to our Patrons Rolls Royce and Ideo and to the Ove Arup Foundation. Particular thanks to the Rector, Pro Rector and everyone at the Royal College of Art who help to make this a happy home for the Awards.